Bouteloua curtipendula (sideoats grama) in late September. Image by Richard Dean Prudenti. 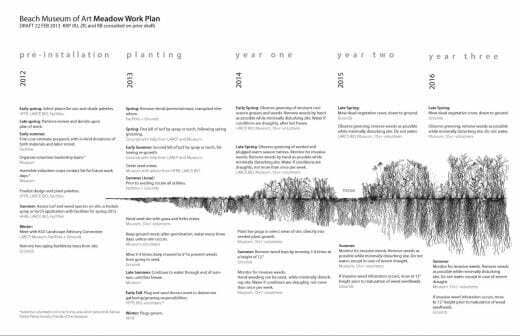 The Meadow is a work in progress – it will take 3-5 years to reach the point where the Meadow holds a dynamic equilibrium of native grasses and wildflowers, cut back each year, but allowed to grow tall in vibrant beauty each season. 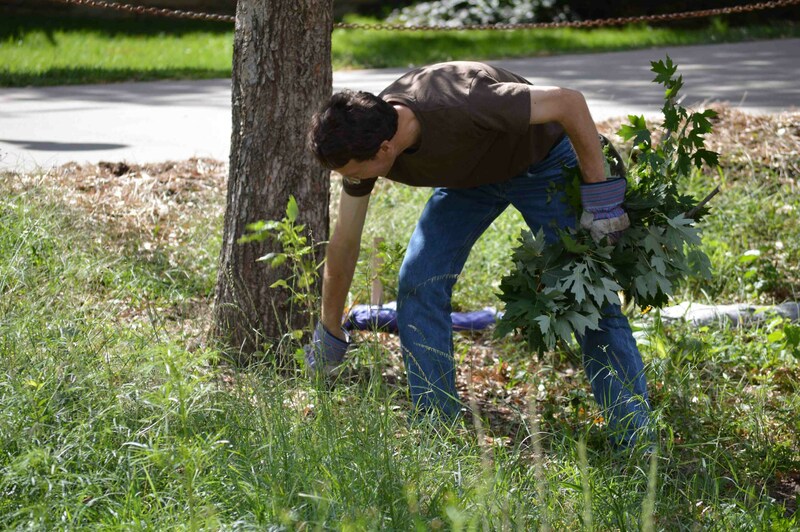 Until then, we have periodic cutting and weeding days to control weeds as the native plants become established. What that means is, the weeds growing in the Meadow are expected and make sense when one considers the long history of the site as a cultural landscape. For more than 100 years, the ground cover of the site has been composed of various exotic (non-native) turf grasses and exotic weeds. 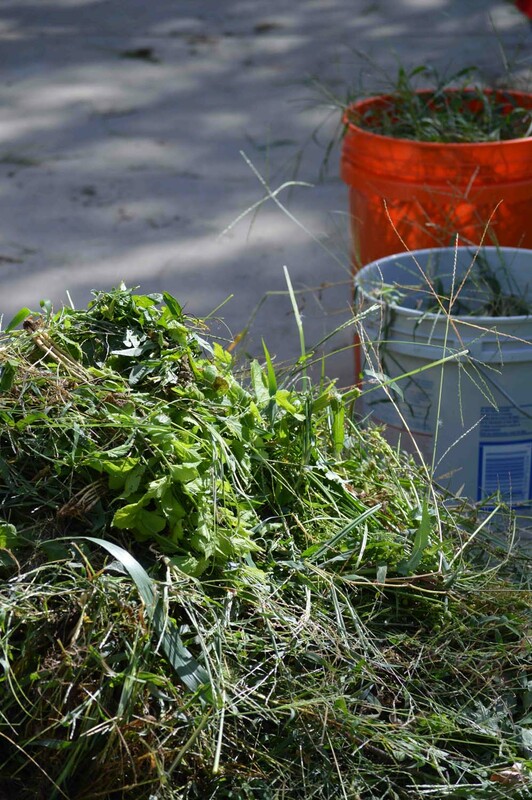 Buckets and piles of weeds. Image by Richard Dean Prudenti. Take, for instance, crabgrass, which was one of the turfgrasses of the site prior to Meadow seeding. It’s a notoriously difficult weed to eradicate (it’s a plant even though we consider it a weed, the latter being a “plant out of place”). In one sense, it’s attractive, but it’s undesirable (therefore we call it a weed) because it fights for control of territory. Therefore we fight against it with consistent and deliberate weed whipping (cutting the vegetation, including the desirable plants) to six inches. We have chosen not to use chemical herbicides, due to their environmental persistence and potential effects upon soil and water health. The Beach Museum as a partner has been very supportive, leading the call for a chemical free landscape in the Meadow. 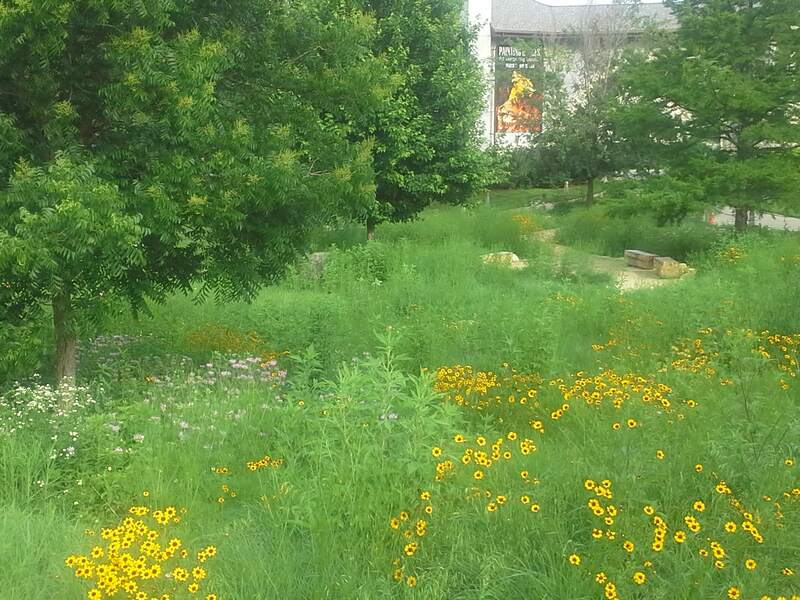 So what about the native plants that we want to see thrive? In most areas, they’re winning the fight already, but not just in the light of day. The fight is underground. Whereas weedy plants spread quickly across the surface of the earth, below ground the “good plants” are taking root and preparing for the major battle – the battle for soil moisture and nutrients. All ages are welcome to weed! Beth Krehbiel with Ruby Smith. Image by Richard Dean Prudenti. Some people may be disappointed, thinking we are not keeping up with the weeds. But the truth is, using limited resources, we are making good progress toward realizing the Meadow. We understand wishing the Meadow to be already “complete.” So much development happens over days rather than years, and turf sod is an instant pleaser to the eye – it happens over hours, not even days. We are accustomed to instant landscapes. Take heart as many desirable plants are thriving in Meadow. 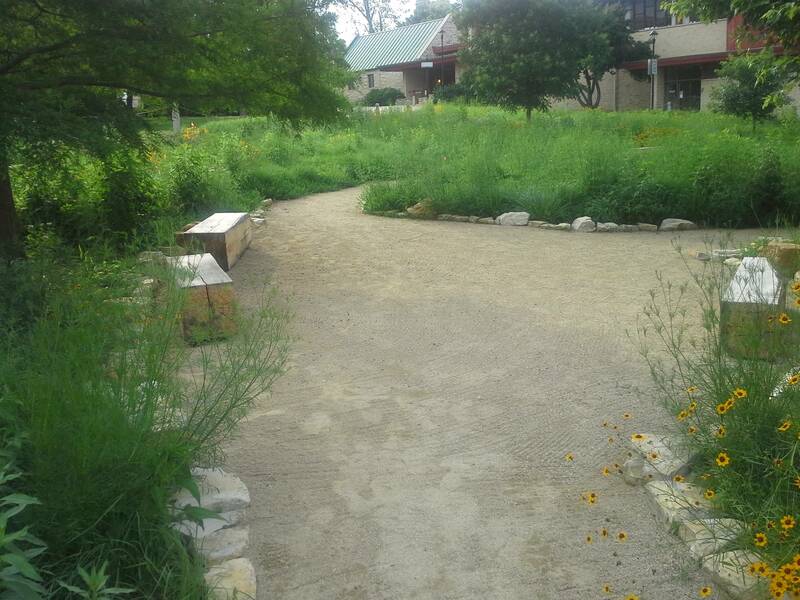 In fact, “Grooming the Meadow” (our way of describing the process of weeding) showed us that our seeding efforts from this summer were a success. 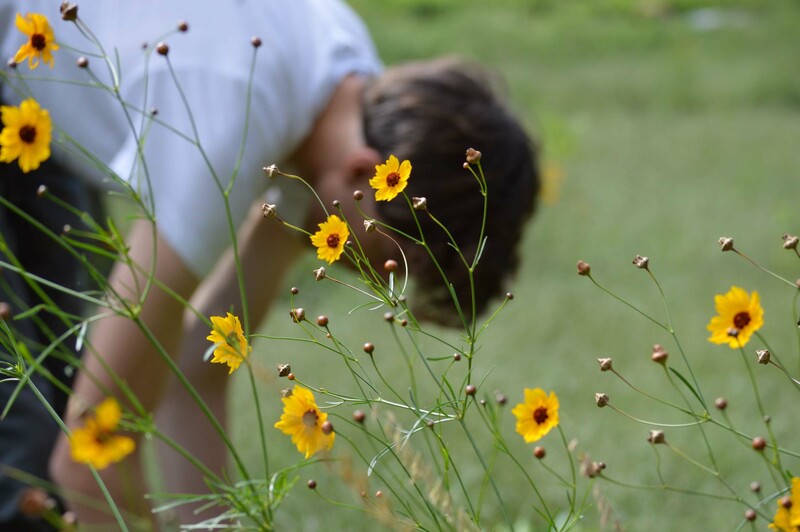 Plains coreopsis and Wes. Image by Richard Dean Prudenti. Wesley, student in landscape architecture. Image by Richard Dean Prudenti. Lee Skabelund, associate professor of landscape architecture. Image by Richard Dean Prudenti. 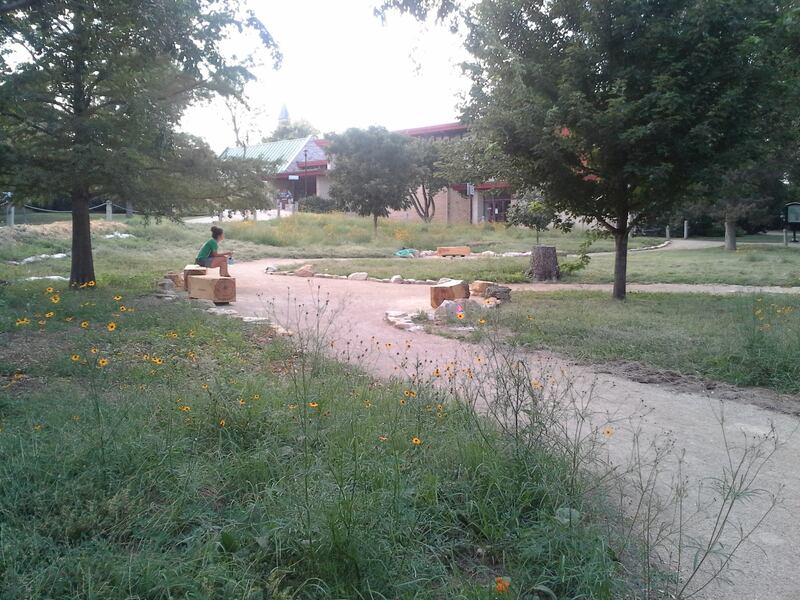 An early evening visitor enjoys the new hackberry benches. Image by Katie Kingery-Page. We’re finally feeling some hot days in the Kansas Flint Hills. In the Meadow, we have already cut back growth three times, in an effort to keep weeds in check as the native species grow in. I describe this to passerbys as allowing the growth above ground to catch up to the growth underground. 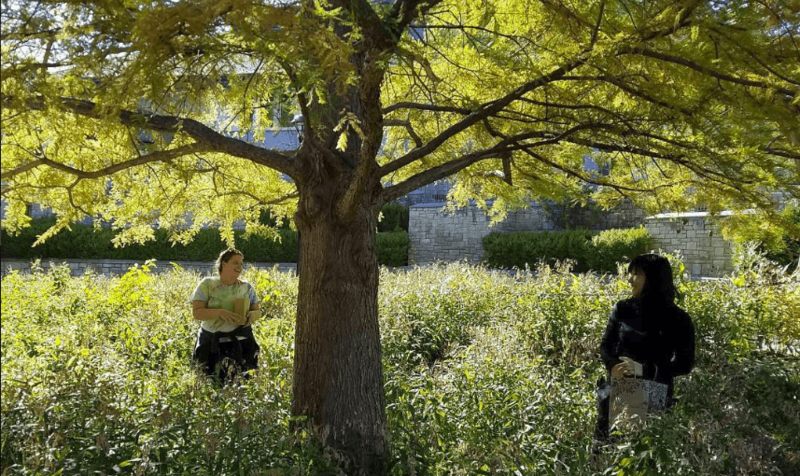 Many studies have shown the effective growth pattern of perennial native prairie species, which tend to first put down deep roots to ensure survival, rather than showy growth above ground in the first season. 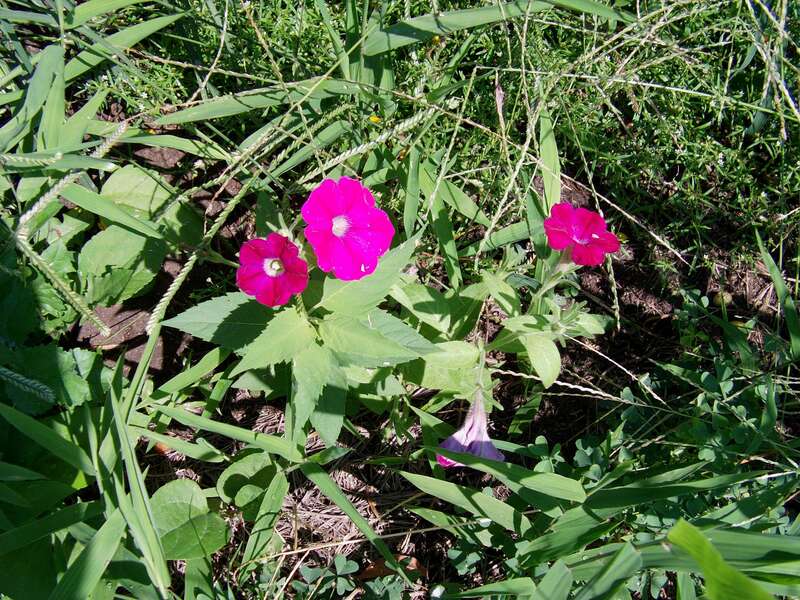 Over the past week, I noted three new species in flower: pitcher sage, butterfly milkweed, and wild petunia. 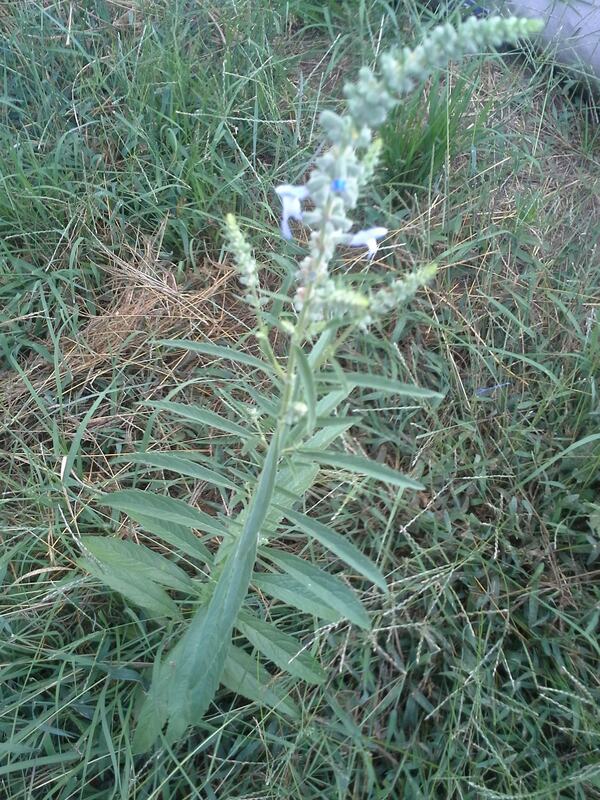 Salvia pitcheri (pitcher sage or blue sage) puts up its first influorescence. Image by Katie Kingery-Page. 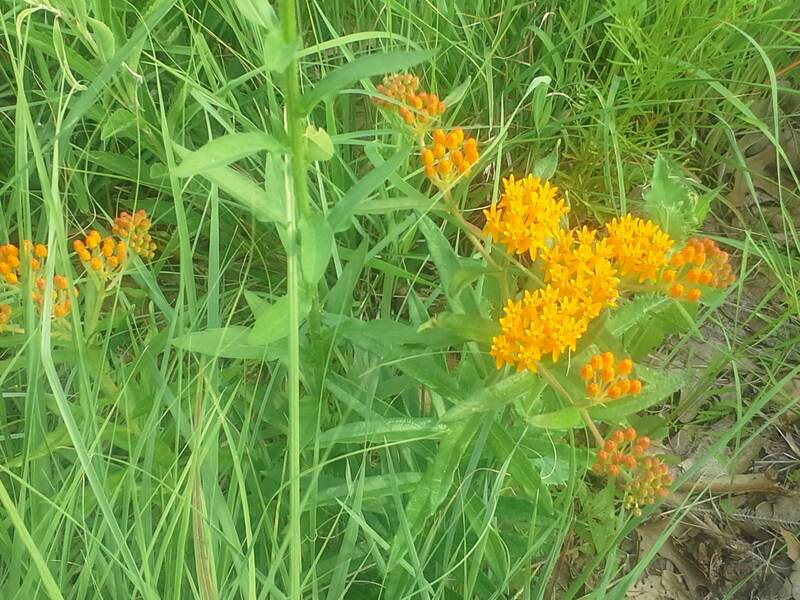 Asclepias tuberosa (butterfly milkweed) nestled between young little buestem and echinacea plants. Image by Katie Kingery-Page. Ruellia humilis (sometimes called wild petunia) shares a piece of ground with young bergamot (bee balm) and Indian woodoats plants. Image by Katie Kingery-Page. Beyond watering (which has been occasional since August–just in response to the sustained, dry heat) and cutting back, some other maintenance is needed. We will put out a call for volunteers, soon, asking for those who may be willing to gingerly hand weed from the edges of paths. 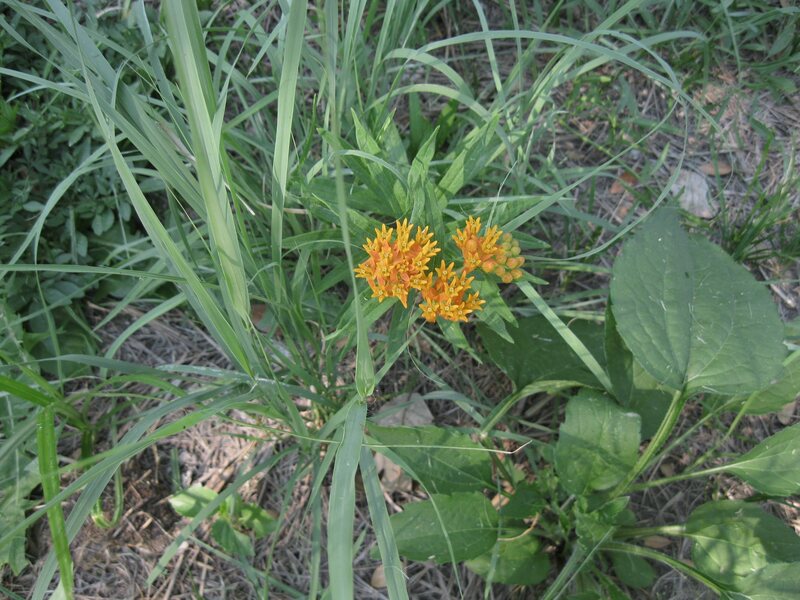 Hand weeding is an excellent chance to learn plant identification. 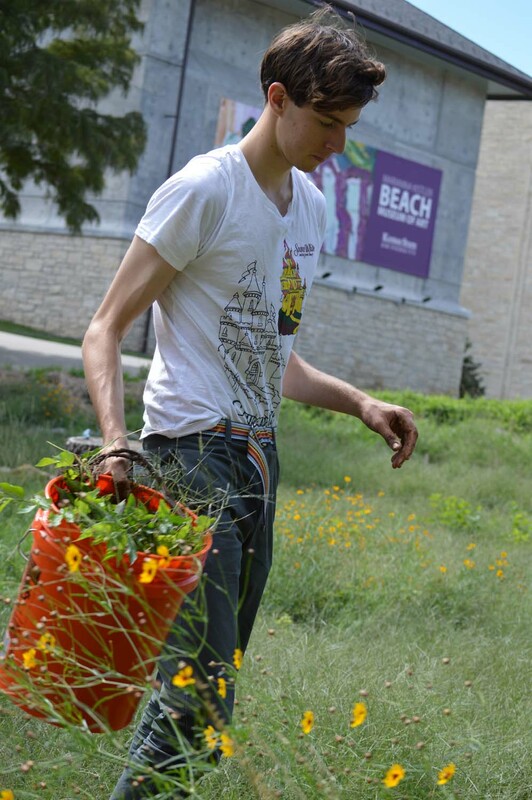 For the upcoming volunteer day, we will have at least two K-Staters on hand to help identify native plants. Stay tuned for date and time. 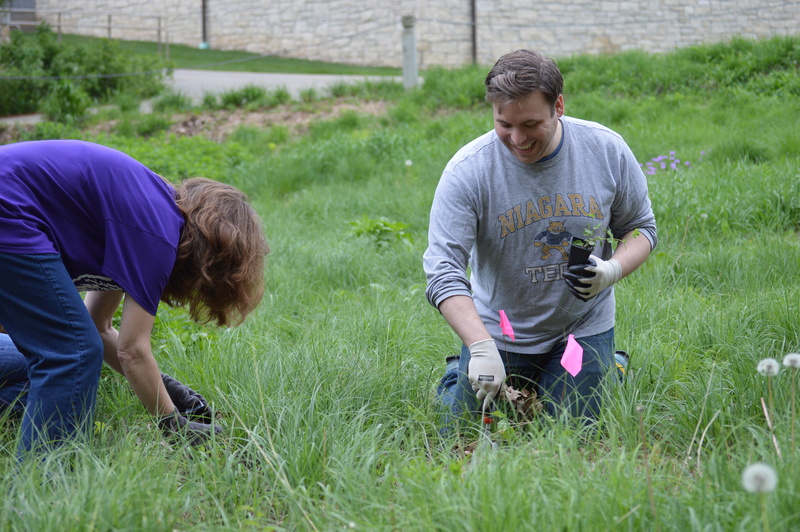 In closing, please join me in making this week a grassroots “grounds crew appreciation week.” The Meadow benefits greatly from the continued guidance of Joe Myers, KSU Physical Plant Supervisor, Facilities Grounds Maintenance. He and his colleagues have helped the project in numerous ways through their generosity of knowledge, time, and skill. These are some of the people who make our campus beautiful. More soon on the volunteer day! 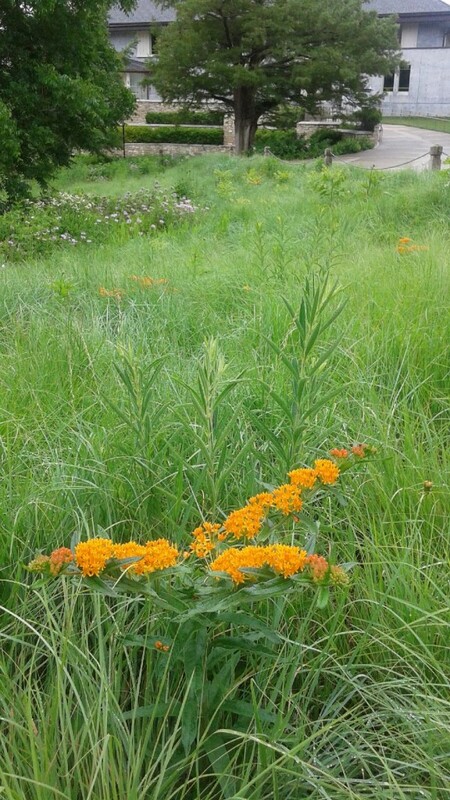 Dispatch from the Meadow on a rainy day: Despite the weeds (weed tree seedlings and pigweed–amaranth–being the most noticeable), quite a bit of positive growth is occurring for native plants. 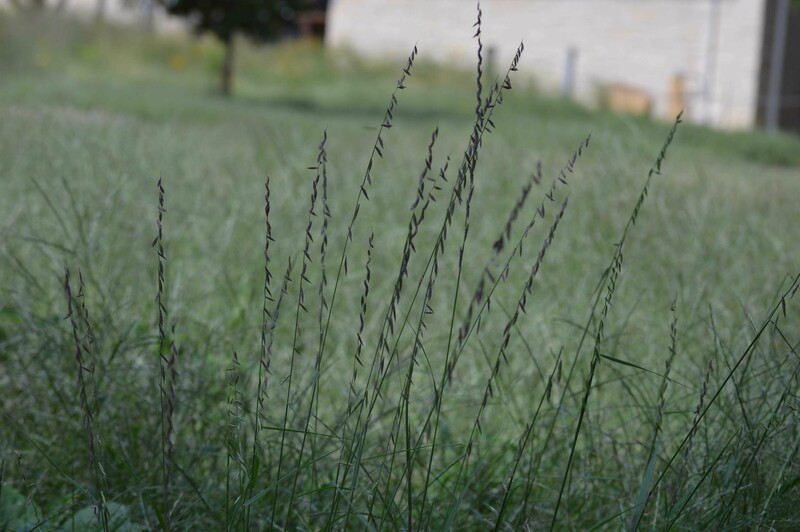 Grasses seen taking hold include little bluestem, american beakgrain, and hairy wild rye. 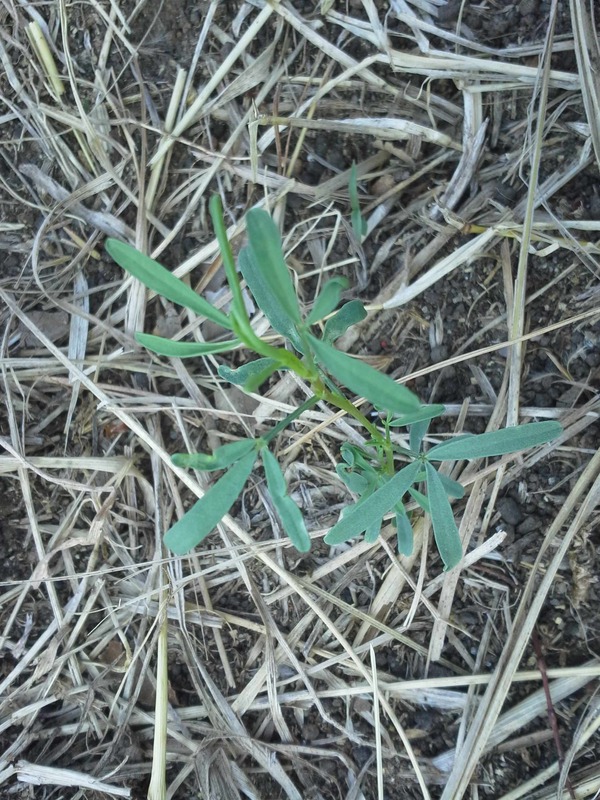 Forb juveniles seen in abundance include the annual plains coreopsis (which will bloom, even if we top it off, due to lateral growth), sweet coneflower, purple coneflower, and purple prairie clover. Plains coreopsis blooming six weeks after seeding the Meadow. Image by Katie Kingery-Page. 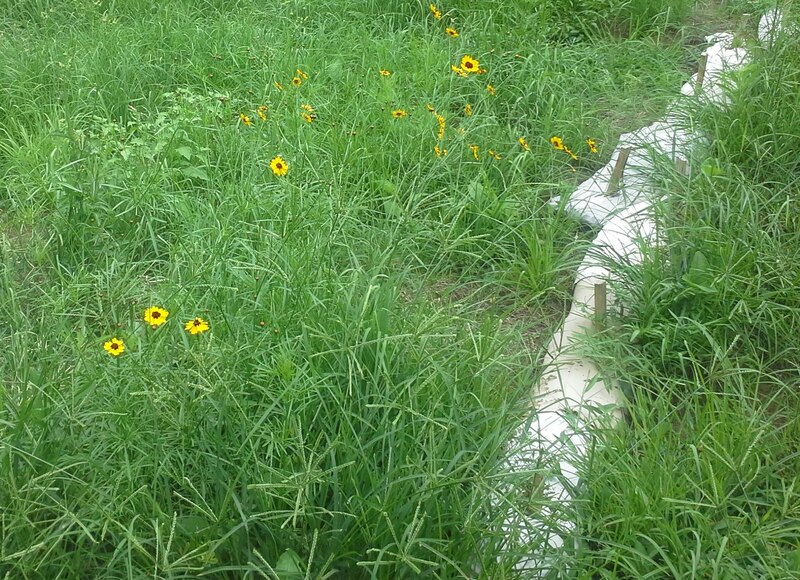 Of our very recently seeded edges, the buffalo grass germinated almost immediately–many small seedlings can be seen. Now we need some good, hot weather to help it grow! Meadow-helpers Troy and Richard seeded the buffalo edges, along with a swath of side oats grama along the sunny part of the ‘humped edge.’ Allow me to explain what the ‘humped edge’ is: the northwestern edge of the side, most prone to erosion, is still protected by a compost berm created by piling up sod stripped from the site. Side oats grama was also seeded around the water connection, to restore the area disturbed by a leak and then replacement of the hookup. The side oats grama has germinated well and is filling in. Our erosion control measures continue to hold up well. The Meadow site in August 2013, six weeks after seeding. Image by Troy Britt. The last area to be planted will be the shady edges, which include several areas, one being the compost berm nearest the museum. Typically, we would not plant the cool season natives of this mix in high summer. Had I known we’d be seeing 60s and 70s in July, I might have tried it! But a more rationale approach is to seed these areas in the fall. 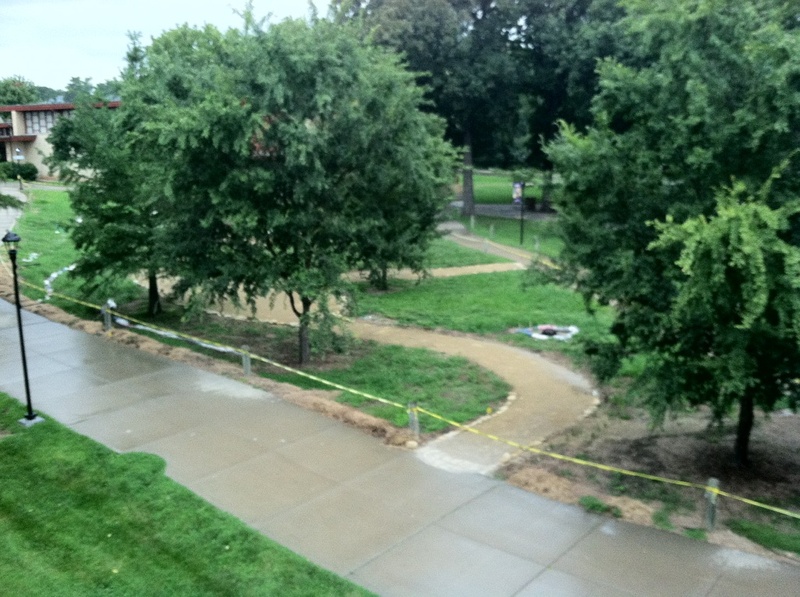 We had a surprise last week: learned that a new utility may be routed through the Meadow site in the spring. We have received assurance that any disturbance will be restored. Apparently the need for this utility came up rather quickly, in the last two months. I will keep you posted as we learn more. The plan for August is to weed wack the lushest areas back to about six inches high, in order to control weedy growth. Also, hand weeding from the edges will be done, strictly for cosmetic purposes. So in about two weeks, it should look a bit more tidy. Please keep in mind and pass the word that “messiness” is part of the game in the first two years. We knew this, expected it, and will manage weeds with planned mows and weed whacking while the native plants slowly grow in. 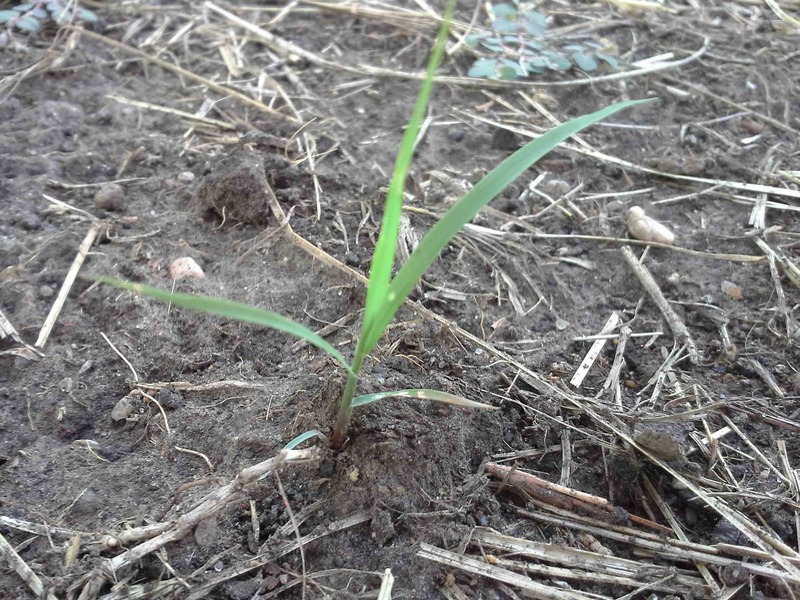 Case in point: A typical little bluestem juvenile can put down 2 feet of roots in the first year, even though above ground it may only grow to 4 or 5 inches. Last but not least at all, two architecture students have been busy working on custom benches from the hackberry logs under the guidance of LARCP faculty, Josh Cheek. The benches will be minimalist forms featuring the beauty of the hackberry grain. Photos of the raw logs and the work in progress will follow in another post, soon! Three weeks since broadcast seeding two custom mixes of native plant seed (one for shade, one for sun), there are signs if germination and growth at the Meadow. Little bluestem juvenile plant, slowly growing in July 2013 at the Meadow. Image by Katie Kingery-Page. Purple prairie clover juvenile plant rises above the straw. Image by Katie Kingery-Page. 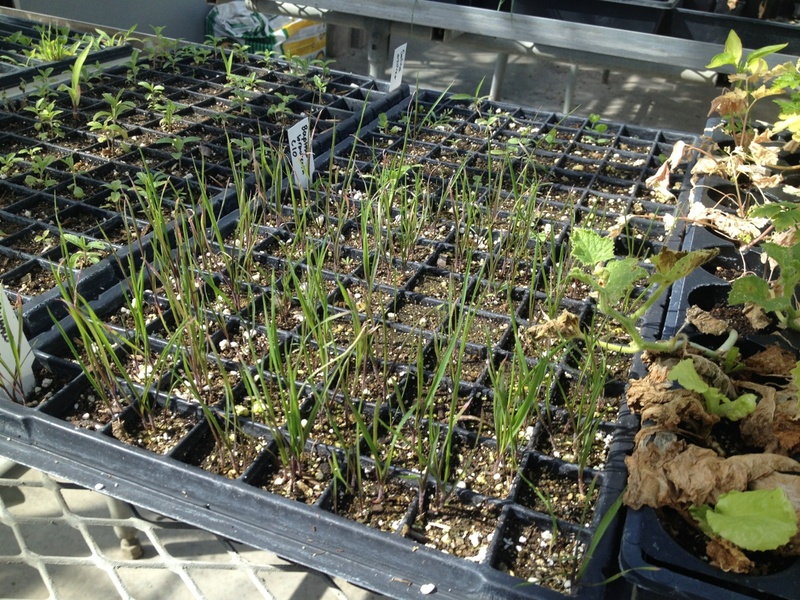 Several species of seedlings and juvenile plants have been identified, including little bluestem, prairie dropseed, american beakgrain, purple prairie clover, purple coneflower, and plains coreopsis. More are to come in the next week. Thus far, we have identified only those plants we can see from the paths, as we are careful to avoid damaging the young plants by walking in the site. 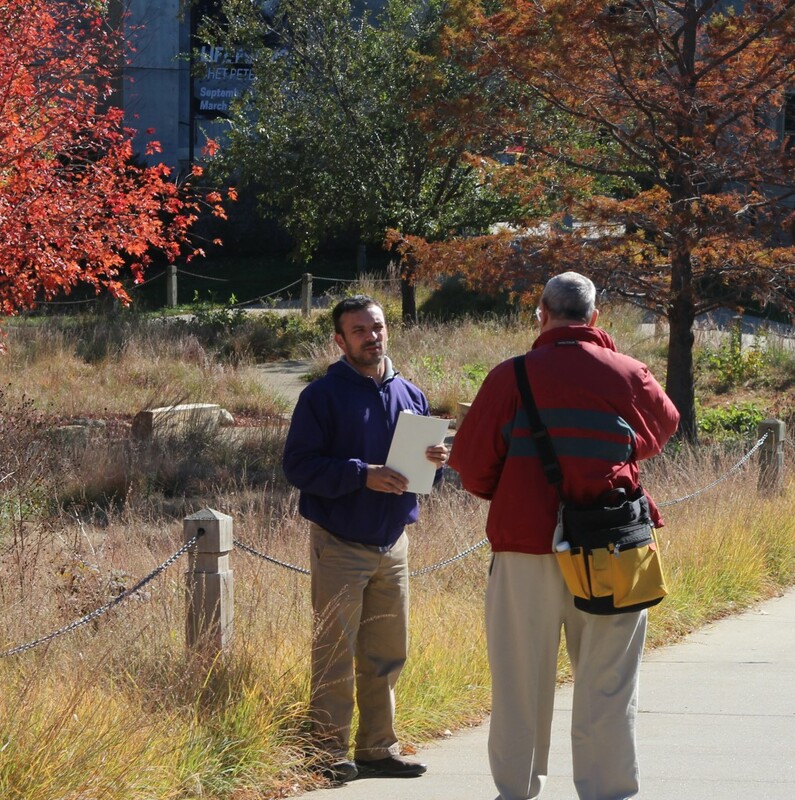 If you’re on the K-State campus, maybe you have observed our team at work. Since seeding, we have planted about 350 live plant plugs, focusing on areas where the native grasses need an extra boost to out-compete weeds. We have also begun to plant the very edge of the site, focusing on seeding a buffalograss mix at sunny edges. Shady edges will be seeded with a different mix in the fall. In general, current planting and weeding has occurred gingerly from the edges. 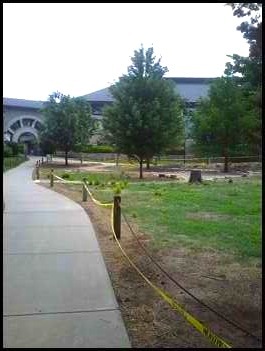 For now, weeding is limited since we cannot walk over the small native plants. A buffalo grass edge has just been seeded by Meadow helpers, Richard Prudenti and Troy Britt. This edge will occur along most sunny lengths of the site. Image by Lindsay Smith. “So what is the plan to keep weeds in check?” you may wonder. 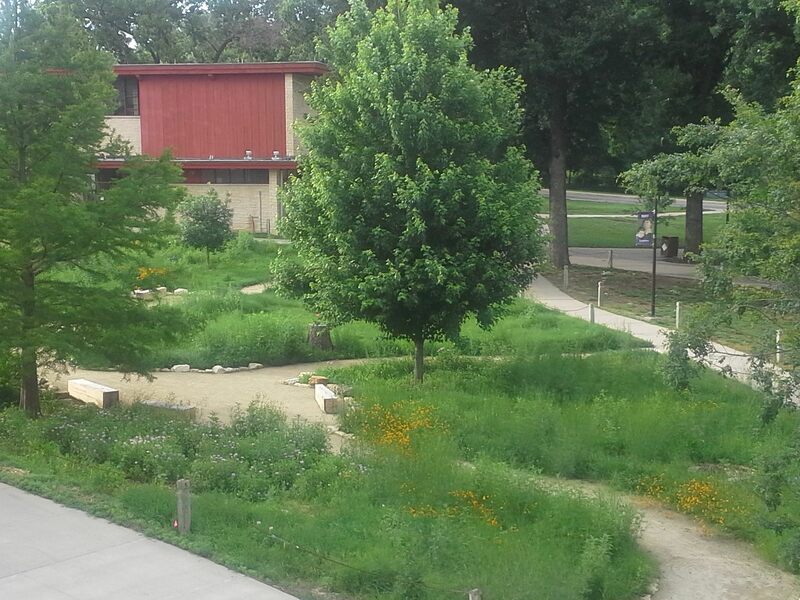 Very soon, in about four weeks, the site will be mowed to a height of six inches in an effort to suppress many annual weeds by preventing seedhead formation. This mowing will also knock back the tree seedlings we see growing in some areas. We’ll continue to keep the young, growing plants and their weedy competitors mowed back to six inches throughout this first season. Some desired plants may not emerge until next spring’s greening in mid-May. Next season, we will continue the mowing and may begin more hand weeding, depending upon the hardiness of the native plant stand. To all who have volunteered, thank you! Your hard work is already paying off. Artist Rhonda R. Janke helps children and adults create soil paint during the Meadow Open House on June 10. Take some raw soil, mix it with a water-based medium such as honey, water or glycerine, and what do you get? If you guessed “soil paint,” you are correct. Did you know that artists’ paints were all soil-based – until about 150 years ago chemists figured out other ways of creating the more commonly manufactured colors used today through machine-grown pigments. Most modern paints are created synthetically rather than from pigments derived from earth, soil, rock, metals, plants, mushrooms, insects and/or shellfish. Artist and soil scientist Rhonda R. Janke could buy synthetically created paint to create her works. 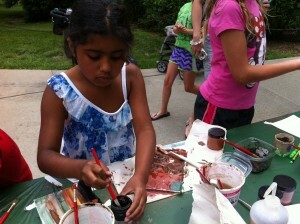 Why take this easy way out when she finds joy in creating paint from scratch – that is, from the earth. Depending on how much paint one needs and availability of materials, soil paint can be an economical alternative to purchasing paint, she said. 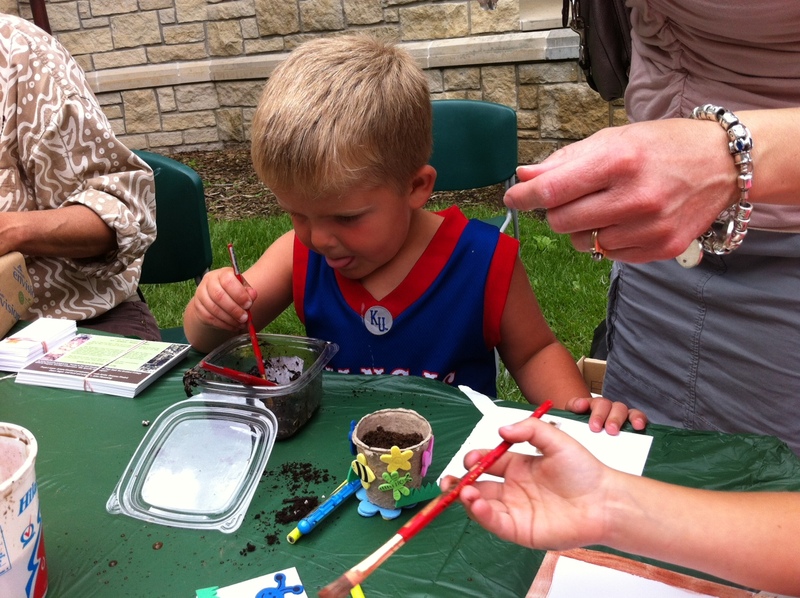 Here’s a link to a handout developed on how to make paint, comments on toxicity (soil paint is a lot safer than contemporary paints) and the historical context: http://parideazafarmart.wordpress.com/workshop-on-making-paint-from-soil/. “Paint was mysterious and confusing to me until I did a lot of reading and experimenting. The mystery has turned into empowerment, but hasn’t lost its magic!” Rhonda states. Empowered is a good word for the arts in general impact us – art makes us feel powerful, like we can do anything if we set our minds and focus on what we want to accomplish. The power of the earth is its ability to grow plants from seeds. The power of some artists is to take soil from the earth and mix it with other natural substances to create a medium for expression. 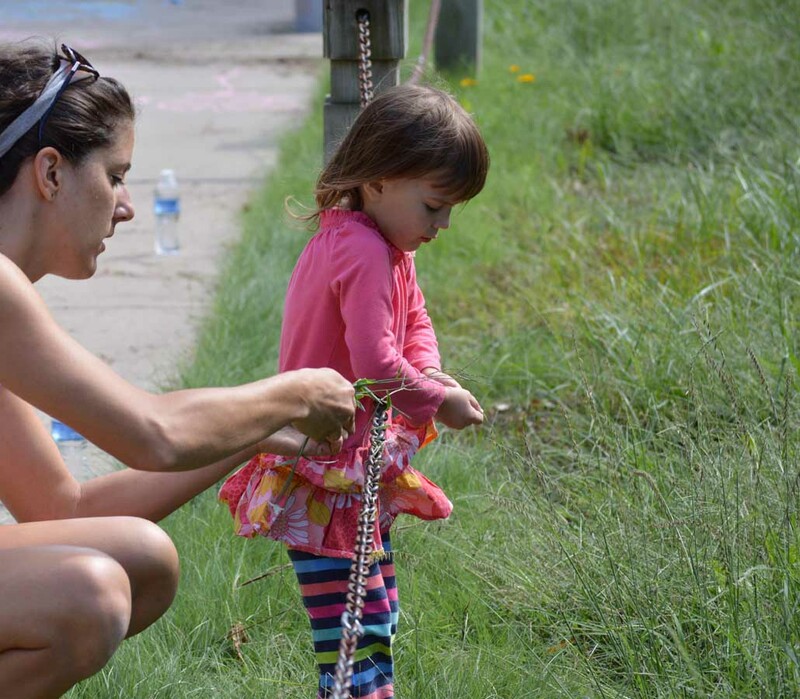 Rhonda invited children and adults to share in the “magic” a few weeks ago during an Open House celebrating the beginning stages of the Meadow project. 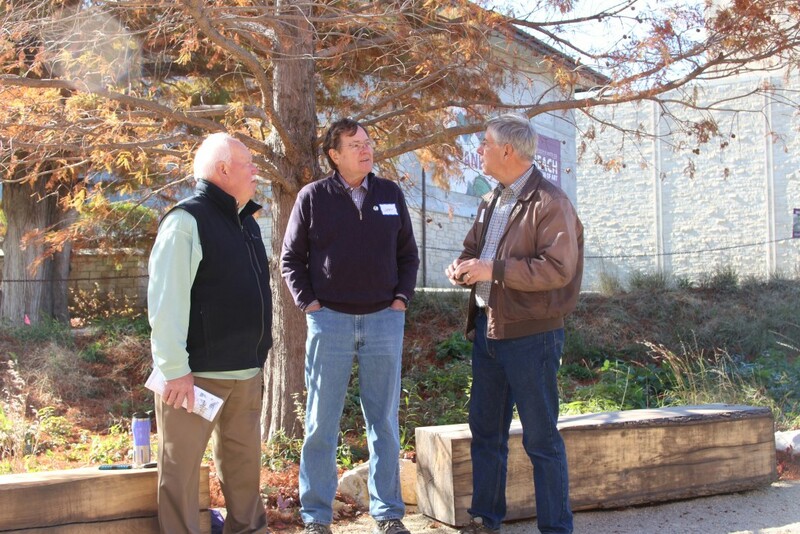 Representatives from collaborating departments and local Boy Scout Troops 74 and 75 also were there and participating in the creation of soil-based paints. At the time, we hadn’t yet planted seed. 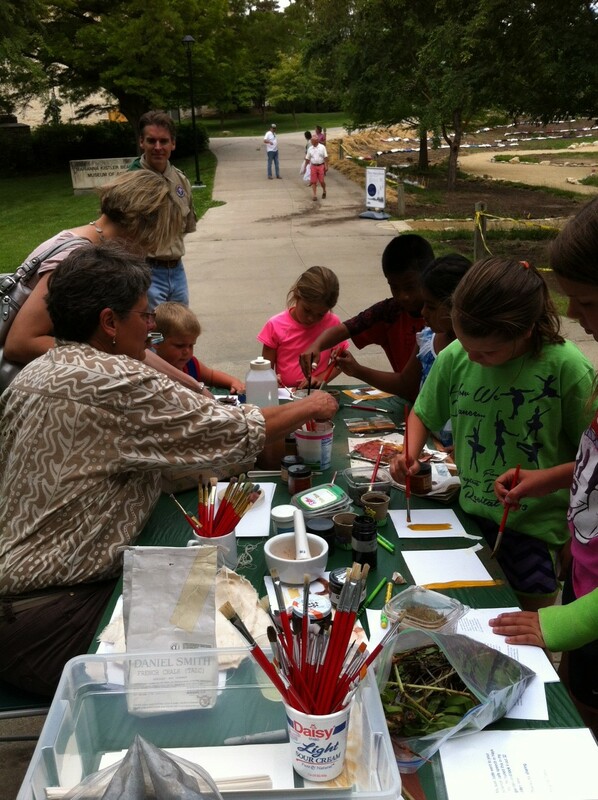 Rather than disturb the soil of the Meadow, Rhonda made a metaphorical connection by bringing three buckets of local soils along with yellow, orange, green and black pigments made from the soils of Italy, Spain and elsewhere. She brought other materials to complete the recipe for paint. Besides pigment, other essential ingredients for paint include a binder that makes it stick together and an adhesive to make it stick to canvas, wood or paper. 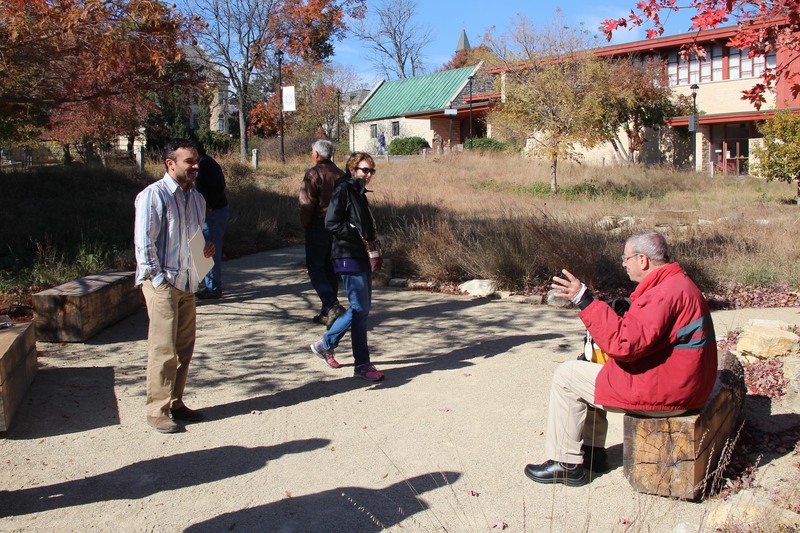 Open House guests worked on paper, and the hope was that they began thinking about the physical link between art and nature – the fact that “soil can make great art, and has been used for centuries,” Rhonda said at the site. What lay below our feet matters for the growth of plants as well as the wonder of materials for everyday use. In her artist statement, she writes: “I feel that materials used can be part of the message… Making the paint and fiber is as important as making the image. I also see nature as a collaborator, not as a resource to be exploited. To read her complete artist statement, go to http://parideazafarmart.wordpress.com/biographic-data/. Also, here’s another link some contemporary soil artists: http://parideazafarmart.wordpress.com/favorite-soil-artists/. “Making paint and using local materials will probably be a major part of my practice from now on, since it fits with my value system of using non-toxic, local materials, and also fits with my aesthetics of knowing where things come from, and how they are made, in addition to just seeing how they look,” Rhonda states. 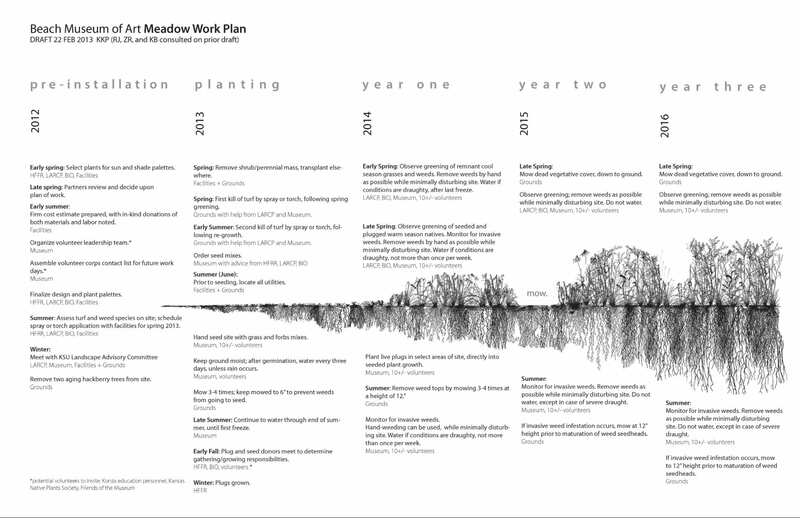 The Meadow project is intended to bring us back to basics, too. 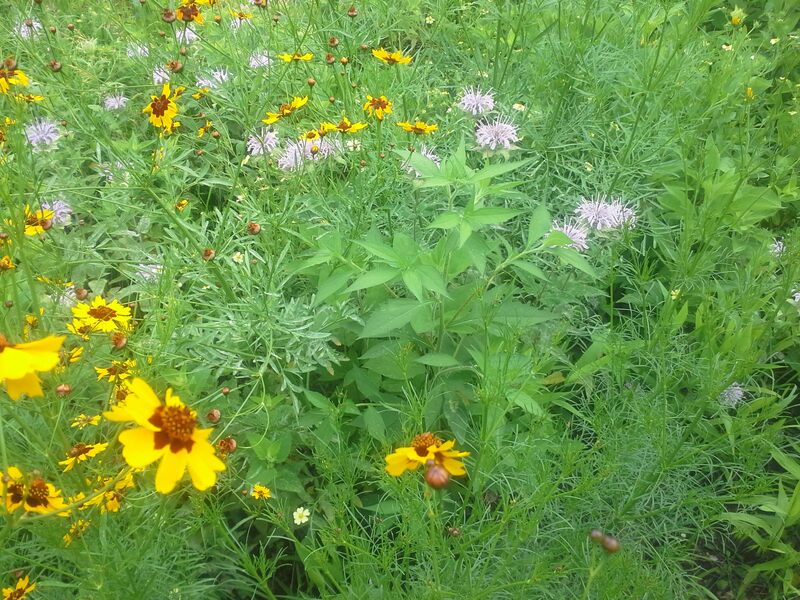 One of the benefits of native plants includes no need for pesticides and fertilizers and less need for mowing. 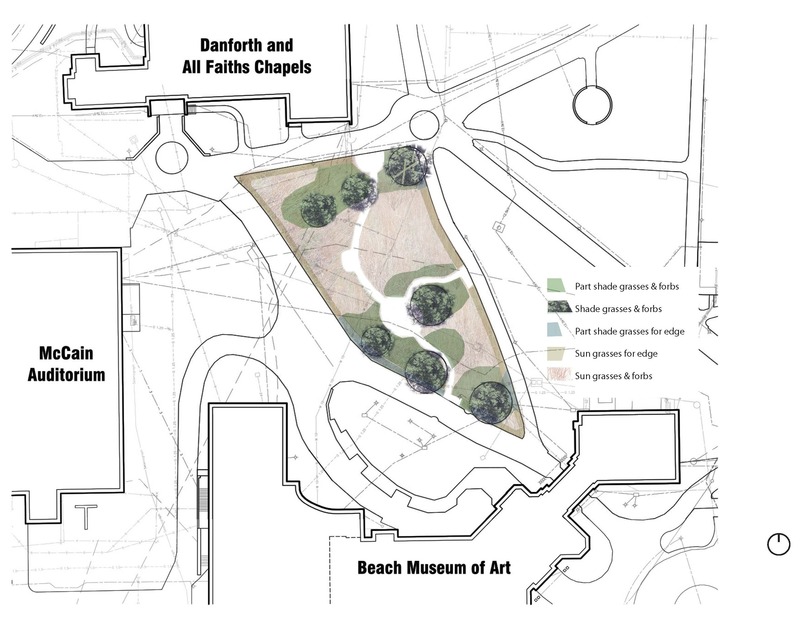 The creators of the Meadow intend this special place to be a meaningful compliment to the museum, and part of that is to provide an extension of the work of Beach educators to make meaningful connections among art, science and enjoyment of the natural world. 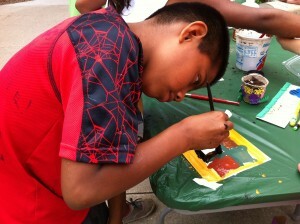 This young artist is creating a work using soil-based paints he created moments earlier. Working with natural materials can add to the fun of making art. The power of this artist is in taking soil from the earth and mixing it with other natural substances to creates a medium for expression.